"Sailors Returning to the States discover the quiet side of the Conch Republic"
The horn sounded just in time for me to step aside as a mane of blond hair passed, attached to the head of someone riding a whining motor scooter. "Excusez," the driver shouted in French as he passed, while plaintive mews escaped from three boxes strapped to the back of his scooter. "That's the cat man," Lani said. "The cat man," she repeated. "he's famous on the board walk. I read about him somewhere. 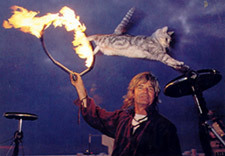 He's trained regular house cats to do tricks, like jumping through fire."